Having withstood the tumult of more than 2,000 years, the grand and glorious Parthenon of Athens is nearly destroyed when a Venetian mortar round ignites Ottoman Turk gunpowder stored inside. Fourteen columns fall, the roof caves in, and myriad ancient sculptures are lost in the blast. In 1687, the Parthenon was extensively damaged in the greatest catastrophe to befall it in its long history. As part of the Great Turkish War (1683–1699) , the Venetians sent an expedition led by Francesco Morosini to attack Athens and capture the Acropolis. Athens, Parthenon, southern side, which sustained considerable damage during the explosion of a powder magazine during a Venetian shelling in 1687. (1687) Warfare almost wipes out an ancient wonder. New York’s Winter Garden is overrun with Sharks and Jets as ‘West Side Story’ begins its Broadway run. The musical, a gritty and controversial updating of Shakespeare’s tragic tale of young love, will be a modest stage hit, while its 1961 film adaptation proves a smashing sensation. US Vice President Richard Nixon meets Senator John Kennedy in a TV station for the first televised presidential debate in US history. As the two candidates spar, it’s obvious that Kennedy is more telegenic and most will consider him the winner, as the era dawns when TV will be a political kingmaker. Attempting to set aside personal and artistic tensions, the Beatles have returned to the studio for the last recording sessions in which all four members participate. On its release today in the UK, Abbey Road will see mixed critical reviews, but fans will make this swan song the Beatles’ best-selling album. US Vice President Richard Nixon meets Senator John Kennedy in a TV station for the first televised presidential debate in US history. As the two candidates spar, it's obvious that Kennedy is more telegenic and most will consider him the winner, as the era dawns when TV will be a political kingmaker. The United States presidential election of 1960 was the 44th quadrennial presidential election, held on Tuesday, November 8, 1960. The Republican Party nominated incumbent Vice President Richard Nixon, while the Democratic Party nominated John F. Kennedy, U.S. Senator from Massachusetts. The incumbent President, Republican Dwight D. Eisenhower, was not eligible for re-election after being elected the maximum two times allowed by the Twenty-second Amendment; he was the first President denied the choice to run for a third term by that amendment. This was the first presidential election in which residents in Alaska and Hawaii were able to participate, as both had become states in 1959. Kennedy is generally considered to have won the national popular vote by 112,827, a margin of 0.17% (although the unusual nature of the election in Alabama has caused some to question this figure), and though Nixon carried more individual states (26 to 22), Kennedy won a 303 to 219 Electoral College victory. The 1960 presidential election was the closest election since 1916, which can be explained by a number of factors. Kennedy benefited from the economic recession of 1957–58, which hurt the standing of the incumbent Republican Party, and he had the advantage of 17 million more registered Democrats than Republicans. Furthermore, the new votes that Kennedy, the first Roman Catholic president, gained among Catholics almost neutralized the new votes Nixon gained among Protestants. Kennedy's campaigning skills decisively outmatched Nixon's. In the end, Nixon's emphasis on his experience carried little weight, and he wasted energy by campaigning in all 50 states instead of concentrating on the swing states. Kennedy used his large, well-funded campaign organization to win the nomination, secure endorsements, and, with the aid of the big-city bosses, get out the vote in the big cities. Kennedy relied on running mate Lyndon B. Johnson to hold the South, and used television effectively. There were 14 unpledged electors and one faithless elector in the election. All eight electors from Mississippi, as well as six of the 11 electors from Alabama, were unpledged and voted for the Byrd/Thurmond ticket, while one faithless elector from Oklahoma voted for the Byrd/Goldwater ticket. Following the election, Nixon unsuccessfully ran for governor of California in 1962, before making a successful campaign for the presidency in 1968, winning re-election by a landslide in 1972. He was later the first United States President to resign, following the Watergate scandal. This election also features the last time the state of Ohio was on the losing end of the presidential election. From 1964 onward, the candidate who won Ohio won the election nationwide. Presidential election results map. Blue denotes states won by Kennedy/Johnson, red denotes those won by Nixon/Lodge, orange denotes the electoral votes for Byrd/Thurmond by Alabama and Mississippi unpledged electors, and a vote for Byrd/Goldwater by an Oklahoma faithless elector. Numbers indicate the number of electoral votes allotted to each state. John Fitzgerald "Jack" Kennedy (May 29, 1917 – November 22, 1963), commonly referred to by his initials JFK, was an American statesman who served as the 35th President of the United States from January 1961 until his assassination in November 1963. Kennedy served at the height of the Cold War, and much of his presidency focused on managing relations with the Soviet Union. He was a member of the Democratic Party who represented Massachusetts in the United States House of Representatives and the United States Senate prior to becoming president. Kennedy was born in Brookline, Massachusetts, to Joseph P. Kennedy, Sr. and Rose Kennedy. A scion of the Kennedy family, he graduated from Harvard University in 1940 before joining the United States Naval Reserve the following year. During World War II, Kennedy commanded a series of PT boats in the Pacific theater and earned the Navy and Marine Corps Medal for his service. After the war, Kennedy represented Massachusetts's 11th congressional district in the United States House of Representatives from 1947 until 1953. He was subsequently elected to the U.S. Senate and served as the junior Senator from Massachusetts from 1953 until 1960. While serving in the Senate, he published Profiles in Courage, which won the Pulitzer Prize for Biography. In the 1960 presidential election, Kennedy narrowly defeated Republican opponent Richard Nixon, who was the incumbent Vice President. Kennedy's time in office was marked by high tensions with Communist states in the Cold War. He increased the number of American military advisers in South Vietnam by a factor of 18 over President Dwight D. Eisenhower. In April 1961, he authorized a failed joint-CIA attempt to overthrow the Cuban government of Fidel Castro in the Bay of Pigs Invasion. He subsequently rejected plans by the Joint Chiefs of Staff to orchestrate false-flag attacks on American soil in order to gain public approval for a war against Cuba. In October 1962, U.S. spy planes discovered that Soviet missile bases had been deployed in Cuba; the resulting period of tensions, termed the Cuban Missile Crisis, nearly resulted in the breakout of a global thermonuclear conflict. Domestically, Kennedy presided over the establishment of the Peace Corps and supported the Civil Rights Movement, but he was largely unsuccessful in passing his New Frontier domestic policies. Kennedy continues to rank highly in historians' polls of U.S. presidents and with the general public. His average approval rating of 70% is the highest of any president in Gallup's history of systematically measuring job approval. On November 22, 1963, Kennedy was assassinated in Dallas, Texas. Lee Harvey Oswald was arrested for the crime, but he was never prosecuted due to his murder by Jack Ruby two days later. Pursuant to the Presidential Succession Act, Vice President Lyndon B. Johnson was sworn in as president later that day. The FBI and the Warren Commission officially concluded that Oswald was the lone assassin, but various groups believed that Kennedy was the victim of a conspiracy. After Kennedy's death, many of his proposals were enacted, including the Civil Rights Act of 1964 and the Revenue Act of 1964. 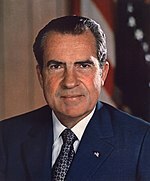 Richard Milhous Nixon (January 9, 1913 – April 22, 1994) was the 37th President of the United States from 1969 until 1974, when he resigned from office, the only U.S. president to do so. He had previously served as the 36th Vice President of the United States from 1953 to 1961, and prior to that as a U.S. Representative and also Senator from California. Nixon was born in Yorba Linda, California. After completing his undergraduate studies at Whittier College, he graduated from Duke University School of Law in 1937 and returned to California to practice law. He and his wife Pat moved to Washington in 1942 to work for the federal government. He subsequently served on active duty in the U.S. Navy Reserve during World War II. Nixon was elected to the House of Representatives in 1946 and to the Senate in 1950. His pursuit of the Hiss Case established his reputation as a leading anti-communist and elevated him to national prominence. He was the running mate of Dwight D. Eisenhower, the Republican Party presidential nominee in the 1952 election. Nixon served for eight years as vice president – at 40, the second-youngest vice president in history. He waged an unsuccessful presidential campaign in 1960, narrowly losing to John F. Kennedy, and lost a race for Governor of California to Pat Brown in 1962. In 1968, he ran for the presidency again and was elected, defeating incumbent Vice President Hubert Humphrey. Nixon ended American involvement in the war in Vietnam in 1973 and brought the American POWs home, and ended the military draft. Nixon's visit to the People's Republic of China in 1972 eventually led to diplomatic relations between the two nations, and he initiated détente and the Anti-Ballistic Missile Treaty with the Soviet Union the same year. His administration generally transferred power from Washington D.C. to the states. He imposed wage and price controls for ninety days, enforced desegregation of Southern schools and established the Environmental Protection Agency. Nixon also presided over the Apollo 11 moon landing, which signaled the end of the moon race. He was reelected in one of the largest electoral landslides in U.S. history in 1972 when he defeated George McGovern. In his second term, Nixon ordered an airlift to resupply Israeli losses in the Yom Kippur War, resulting in the restart of the Middle East peace process and an oil crisis at home. The Nixon administration supported a coup in Chile that ousted the government of Salvador Allende and propelled Augusto Pinochet to power. By late 1973, the Watergate scandal escalated, costing Nixon much of his political support. On August 9, 1974, he resigned in the face of almost certain impeachment and removal from office. After his resignation, he was issued a pardon by his successor, Gerald Ford. In 20 years of retirement, Nixon wrote nine books and undertook many foreign trips, helping to rehabilitate his image into that of elder statesman. He suffered a debilitating stroke on April 18, 1994 and died four days later at the age of 81.